'It's neat to talk to local people who do exciting things outside of here," said Julia Giacoboni, pictured above, recipient of a Gracie Award for outstanding public affairs program in a student market. 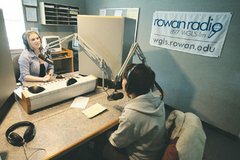 Tackling the tough topics on a local radio station has led to national recognition for a Rowan University student. Julia Giacoboni, a 20-year-old junior, is the recipient of a Gracie Award, presented by the American Women in Radio & Television, for outstanding public affairs program in a student market. "It's really exciting to be honored," Giacoboni said. "When it came time to enter ... I knew a lot of my shows from last year were good. They're topics that aren't talked about everyday." Giacoboni won the award for her work on "The Women's Room," a half-hour talk show that runs Thursdays at 5 p.m. on Rowan Radio 89.7 WGLS-FM. Giacoboni submitted two, seven-minute demos for consideration in the competition: an interview with Barbara Haney Irvine, founding president of the Alice Paul Centennial Foundation (now the Alice Paul Institute); and a show on ovarian cancer awareness featuring guest Kendal Seidel, a survivor of the disease. The Gracie is the second won by "The Women's Room," which began airing in 2002. Former host Kelly King also won a Gracie in the same category for a show on breast cancer awareness two years ago. "When I took 'Women's Room' over, Kelly had done a great job," Giacoboni said. "Kelly trusted me to keep finding new guests and finding fresh topics to cover." Hosting the award-winning show is only a small part of Giacoboni's duties at Rowan Radio. She also hosts "A Community Affair" (Monday, 5 p.m.), "She's Julia and This is her Rock Show" (Tuesday, 11 p.m.), and with senior Ashley Smith, she co-hosts the "Rowan Radio Early Bird Special with Julia and Ashley Show" (Tuesday, 7 a.m.). "Every once in a while you meet a student with something special. Julia is one of them," said Frank Hogan, WGLS general manager. "She's dependable, reliable. She's doing great work. She's not a typical college student." The Gracie is Giacoboni's third major award this academic year. 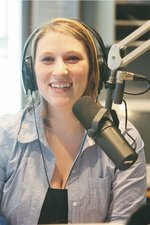 In November, she was named best college radio public affairs anchor/host at the Philadelphia Achievement in Radio College Award. Later this month (and a week after her 21st birthday), Giacoboni is going to Las Vegas to accept a first-place award with co-producer Brian Kanady, in the best educational program category of the 2008 International Broadcast Education Association competition for their 30-minute documentary, "Fading Farms and Saving Grace: Preserving the Garden State." Giacoboni joined Rowan Radio her freshman year with no previous radio experience. By her second semester she got a Thursday morning shift on air. "I always listened to local stations. I would do pretend radio shows with my friends," said Giacoboni, a native of Cedarville and 2005 Bridgeton High School graduate. "I listened to Rowan Radio growing up." She quickly made friends and jumped at the chance to become the station's new public affairs director when the position opened up. In the summer of 2006, Giacoboni became the host of "The Women's Room." "What I love about Rowan Radio is public affairs," she said. "Down the road I'd like to be able to do public affairs on a larger level. I like interviewing people." Since becoming the host of "The Women's Room" she has interviewed Megan McCafferty, author of the Jessica Darling series for young adults. "I always loved her books," Giacoboni said. Giacoboni has also interviewed Michele Lacina, a Mullica Hill woman who had an entry published in "Chicken Soup for the Soul in Menopause." "It's neat to talk to local people who do exciting things outside of here," Giacoboni said. Giacoboni is now looking for an internship and she is not sure what her future career holds. "The chances of me being a morning show DJ are very slim ... but I'd love to do that," she said. One might think hosting four shows a week at Rowan Radio wouldn't leave Giacoboni with much spare time, but she also works a part-time job at a Friendly's restaurant in Vineland and has another part-time job as a disc jockey and engineer at WSNJ-AM (1240/1440) in Bridgeton. She still manages to carry a 3.4 GPA, although she admits sometimes this semester class has taken a backseat. "I love working at Friendly's. I love working here (at Rowan Radio). WSNJ is relaxing," she said. "It hasn't been a struggle to get myself where I need to go."